lower left: TS. (in monogram) 1834. The sitter's daughter, Emily Hopkinson Scovel [1839-1883]; her daughter, Florence Scovel Shinn [b. 1871], New York; purchased 11 April 1918 by Thomas B. Clarke [1848-1931], New York; his estate; sold as part of the Clarke collection 29 January 1936, through (M. Knoedler & Co., New York), to The A.W. Mellon Educational and Charitable Trust, Pittsburgh; gift 1942 to NGA. Acquisition date according to 1928 Clarke exhibition catalogue annotated with information from files of M. Knoedler & Co., NY (copy in NGA curatorial records and in NGA library). This source also places the painting in the collection of Charles Harris, an associate of Clarke's, between 1921-1922. It is possible that Harris purchased the painting and resold it to Clarke. Exhibition of Paintings by Early American Portrait Painters, The Union League Club, New York, December 1921, no. 3. Memorial Exhibition of Portraits by Thomas Sully, Pennsylvania Academy of the Fine Arts, Philadelphia, 1922, no. 201. Exhibition of Early American Portraits on Loan from the National Gallery of Art, Washington, D.C., Pack Memorial Public Library, Asheville, North Carolina, 1949, no. 11. From Plymouth Rock to the Armoury, The Society of the Four Arts, Palm Beach, Florida, 1950, no. 19, repro. The Face of American History, Columbia Museum of Art, South Carolina, 1950, no. 18. American Portraits from the National Gallery of Art, High Museum of Art, Atlanta, 1951, no. 20, repro. (organized by the Atlanta Art Association). [Opening exhibition of new art gallery], Randolph-Macon Woman's College, Lynchburg, Virginia, 1952-1953, no cat. Famous Americans, Washington County Museum of Fine Arts, Hagerstown, Maryland, 1955, no cat. Hart 1909, no. 784, 82. Biddle, Edward, and Mantle Fielding. 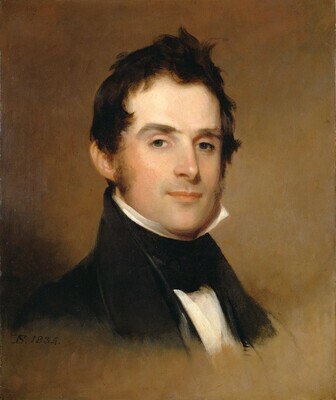 The Life and Works of Thomas Sully (1783-1872). Philadelphia, 1921: no. 809, 177. Catalogue of the Memorial Exhibition of Portraits by Thomas Sully. Exh. cat. Pennsylvania Academy of the Fine Arts, Philadelphia, 1922: no. 201, 149. American Paintings and Sculpture: An Illustrated Catalogue. National Gallery of Art, Washington, 1970: 112, repro. American Paintings: An Illustrated Catalogue. National Gallery of Art, Washington, 1980: 241, repro. Torchia, Robert Wilson, with Deborah Chotner and Ellen G. Miles. American Paintings of the Nineteenth Century, Part II. The Collections of the National Gallery of Art Systematic Catalogue. Washington, D.C., 1998: 178-180, color repro.